Being Feng Shui architects, we have a spatial design orientated approach to Feng Shui and we teach in a practical, efficient and down-to-earth manner with the learning of the classical theories always supported by case studies and practical on-site applications in a modern environment. I'm not one of those people who loves to praise and hero-worship teachers at all! But credit where its due, and I have to say that I am always so impressed at your ability to read over a case study and within minutes see exactly what needs to be done, when I may have been studying the case for days! I am also touched that you somehow find time in your busy schedule to offer your advice, and the patience to shed some light on the various aspects of Feng Shui when I get stuck or confused. This is a great support to me, especially since I work professionally, so I need to get it right, but do not have a mentor or fellow student locally to discuss things with. 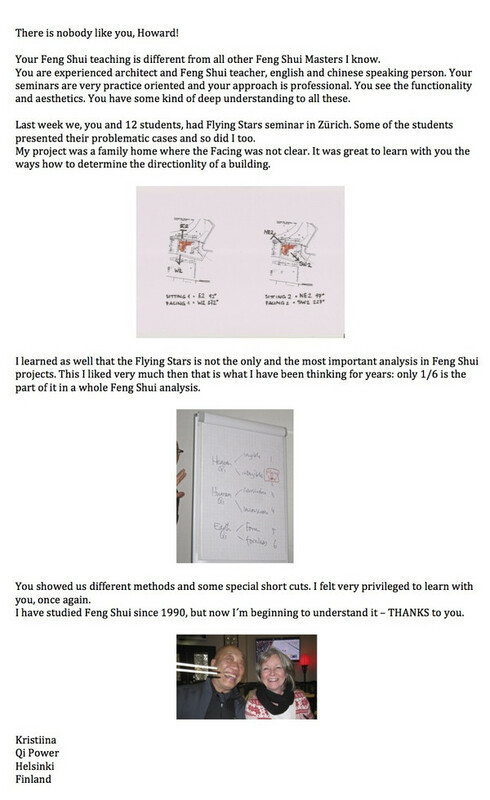 I am extremely grateful, and eager to study more with you when I can, to soak up some of your profound Feng Shui knowledge and experience.